We’ve tapped our favorite seafood-friendly chefs and somms for their riffs on show-stopping dishes and pairings. Come Christmas Eve, many families tuck into yet another roast, be it ham, turkey or goose. Not true for folks of Italian heritage. Eschewing meat hailing from land and sky, Italian families instead reach for frutti di mare—fruits of the sea—for their Yuletide feast. While the meal can include anything from whole branzino and baccalà (dried, salted cod), to shrimp and sardines, the “no meat” rule is the only one that sticks. In true Wine Enthusiast fashion, we’ve tapped our favorite seafood-friendly chefs and sommeliers for their riffs on show-stopping dishes and pairings that bring this tradition to life. A perfect pair to this Vietnamese-style crispy snapper and its bright dipping sauce is Southold Farm + Cellars’ 2009 La Belle Fille. A méthode champenoise Pinot Noir and Chardonnay sparkler from Long Island’s North Fork, it boasts a floral nose with a hint of pear, while its rich, dry finish offers a refreshing palate cleanse. Rinse the fish, pat dry and cut two slits on each side of the fish. Sprinkle both sides lightly with salt. Mix the cornstarch and flour on a plate, and dredge the fish in the flour mixture. Shake off any excess. Use a deep fryer, or fill a large, shallow pot with 3–4 inches of canola oil and set over high heat until the oil registers 350°F on a candy thermometer. When the oil is ready, fry the fish until the skin is golden-brown, 6–12 minutes. Transfer to a plate lined with paper towels. To make the dipping sauce, combine all the remaining ingredients in a medium mixing bowl and stir until the sugar is dissolved. 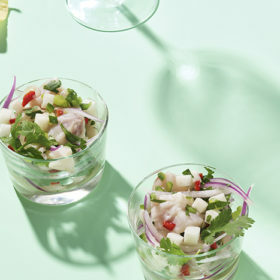 Serve the fish hot with the dipping sauce and pickled radish alongside. Serves 4. Virginia is becoming one of the leading oyster-producing regions of the country, with a fully developed oyster trail in the works. Utilizing Virginia-grown oysters—which have a meatier, brinier profile than their Northeastern and Pacific counterparts—this recipe takes a little work to assemble, but it’s well worth the labor. The rich saltiness of the oysters is elevated by the prosciutto and herbaceous compound butter. As for pairing, Brandt applies that age-old wine pairing adage, “what grows together, goes together.” She suggests the 2013 Steel Chardonnay from Chatham Vineyards, which has floral honeysuckle notes, briny minerality and laser-focused acidity. “This wine was grown within the waterways the oysters were cultivated in, a true merroir-terroir pairing,” she says. Whip the butter in an electric mixer using the flat paddle until light and fluffy. Add the chives, thyme, arugula and Italian parsley, stirring to combine. Lay a large rectangular piece of parchment paper on the surface, spooning out the butter mixture in a thick line along the top third. Roll the top edge over the butter, forming a log. Secure the ends and refrigerate until ready to use. The butter may be frozen. Heat a medium-sized sauté pan over medium-low heat. Add the bacon and cook slowly until crisp and the fat is rendered out. Remove from heat and scoop out the bacon with a slotted spoon. Pour half of the bacon fat into a medium-sized bowl, and set aside. Return the pan with the remaining bacon fat to medium-low heat. Add the Swiss chard and salt. Cover and cook slowly until the chard is evenly wilted, and set aside. Preheat oven to 350˚F. Place the rye slices on a sheet tray or right on the baking rack and toast until very dry and a bit browned. Let cool and crumble the toasted rye into the bowl with the bacon fat. Using your hands, rub the fat into the crumbs. Add the cooked bacon bits and work in as well, seasoning with black pepper. Shuck the oysters and place on a baking sheet, cup-side up. Cut quarter-sized pieces of compound butter, enough for each oyster, and place on each bivalve. Place a small piece of prosciutto on top of the butter, followed by a small amount of wilted Swiss chard. Place a cube of brie cheese atop each constructed oyster. Lastly, top with the bacon-bread crumb mixture. Set oven to 375˚F. Bake oysters approximately 15 minutes, being careful not to overcook. The oysters should be firm and opaque when done. Clambakes are not just for summer. This wintertime adaptation of the classic beachside meal utilizes all of the same shellfish—lobsters, clams, mussels and scallops—but switches things up with seasonal citrus, in this case, clementine. A former sommelier and chef, McAuley produced her Ripe Life brand of wines with her flagship Clambake Chardonnay from Mendocino, specifically created to pair with summertime clambakes. She’s also released a Syrah-based rosé. For this dish, she suggests either wine. “Both wines have a great acidic backbone to bring out the best in seafood (and cut through that dunk of butter),” she says. Scrub the clams thoroughly under cold, running water to remove sand. Refrigerate until ready to use. Rinse the mussels under cold, running water and de-beard, if necessary. In a large, 5-gallon stockpot, heat olive oil and sauté onion and fennel bulb. Season liberally with sea salt, and cook at medium-low heat for approximately 15 minutes, or until onions are translucent, stirring occasionally. Add garlic, fennel seeds, clementine peels, chopped rosemary and thyme leaves. Cook for 15 additional minutes. Add cumin, and cook for 2 minutes. Raise the heat to medium, adding in the potatoes, carrots and additional rosemary and thyme sprigs in separate layers. Add 1½ cups hot water, Chardonnay and 2 teaspoons of sea salt. Bring the pot to boil. Layer (in order) clams, mussels, scallops, a few pinches of cumin and finally, the lobsters. Reduce heat to medium, bringing the water to a simmer. Cover with lid and cook for 4 minutes. Move the lobsters around the pot to ensure even cooking. Simmer for 4 additional minutes, or until the shells of the clams and mussels have opened and the lobsters are bright red. Remove the lid, and place the lobsters to the side. Distribute the shellfish evenly amongst 4 bowls, and ladle the base over the top. Remove and discard lobster heads. Split lobster tails in half and remove the arms, then distribute lobster pieces evenly. Grate clementine zest over each bowl to garnish. Top with generous dollops of softened butter and additional thyme leaves (to taste) just before service. Though he owns and operates one of New York City’s top sushi destinations, Borgognone is from a big Italian-American family that celebrates The Feast of the Seven Fishes every year. He shared this riff on the classic dish, which uses dried salt cod, or baccalà, to deliciously simple effect. As for the wine, reach for Feudi di San Gregorio’s Fiano di Avellino—from Campania—full of pineapple, citrus and wet stone flavors. It is the perfect foil to this dish’s savory and salt flavors. Soak the baccalà for up to 24 hours, changing the water 4–5 times. Drain the cod, pat it dry and cut into serving pieces. In a skillet, sauté garlic and parsley in olive oil until it becomes fragrant. Add tomatoes and simmer, then add olives and capers. Lightly dredge the pieces of baccalà in the flour. Add remaining olive oil to a separate pan and fry the fish until they are lightly browned. When finished, add the baccalà to sauce. Preheat oven to 350˚F. Transfer the baccalà and sauce to the oven. Cook for 15 minutes, or until sauce has reduced. Serves 4–6. Grilled whole fish is always a delicious and dramatic centerpiece for any table, and even more so for this feast. Served atop a warm salad of potatoes, feta and tomatoes, this simple dish is bound to be a new favorite classic. Preheat a grill or grill pan to medium-high heat. Brush fish with olive oil and season with salt and pepper. Place on the grill and char on each side for approximately 8 minutes. Meanwhile, in a large heavy-bottomed pan, heat the olive oil over medium heat. Add the garlic and potatoes, and cook until browned. In the same skillet, add tomatoes, olives, onion rings, dry oregano and feta cheese, until just heated through. Transfer to a serving platter and place the fish on top of the warm salad. Squeeze fresh lemon juice on top, then drizzle with olive oil, and sprinkle with fresh herbs. Serves 4. The classic southern French dish gets a full-throttle update with six different kinds of fish, including oysters, squid and shrimp. Fresh herbs like parsley, tarragon and even saffron keep things light. Heat a large pot over medium-high heat. Add the olive oil, heat for a couple of minutes, and then add the leeks and fennel. Sauté for 5–7 minutes, or until the vegetables begin to soften. Add the potatoes, white wine, lemon juice, orange juice, saffron, garlic, fish stock and 1½ cups of the tomatoes. Stir to combine, and then add the clams. Cook for 3–4 minutes, or until the clams are just starting to open, and add the remaining seafood. As soon as the stew begins to boil, remove from heat. Season to taste with salt and pepper, and add the remaining 1½ cups of the tomatoes, as well as the parsley and tarragon. Evenly distribute the bouillabaisse among serving bowls. Serve immediately. Serves 4–6. It’s not a truly Italian meal until the noodles come out. With a creamy, smoky dish like this, grab a bottle with a balance of citrus and earthy notes. Bring a large pot of water to a boil, Cook the noodles and set aside. In a large skillet over medium heat, add 2 tablespoons of olive oil, the leeks, and salt and pepper, to taste. Cook over until soft and lightly browned. Set the leeks aside, and clean out the pan. Place the skillet over high heat. Add 2 tablespoons of olive oil, and sauté the jalapeño and shallot until soft, approximately 1–2 minutes. Add the cooked leeks, trout and chicken stock (or water). Simmer for about 6–7 minutes, or until the stock is reduced by about half. Add the capellini noodles to the pan, and bring back to a boil. Toss noodles to coat with ingredients. Add the crème frâiche, lemon juice and parsley. Cook until the sauce thickens up a little. Serve with more parsley as garnish. Preheat a 10-inch sauté pan on the stovetop. Meanwhile, season the halibut with salt and pepper evenly on both sides. Add butter into the hot pan, then add the halibut and sauté until browned and crispy, about 4 minutes. Repeat with other side and finish cooking by placing the sauté pan with the halibut in the oven, cooking until medium well, about 5 minutes. Remove the fish from the oven and let rest while prepping the salad. Add the clarified butter to a small skillet over low heat. Add the cooked lobster meat and a couple of fresh tarragon leaves, until just warm. Transfer the lobster meat into a small bowl and add the tarragon vinaigrette, wild arugula and orange segments and toss to coat. To serve, place the halibut on dinner plate and top with the warmed salad, pouring any remaining dressing over the fish. Serves 2. Take all ingredients and place in a tabletop blender. Puree the vinaigrette on medium high speed till smooth and slightly creamy. Once vinaigrette comes together check the seasoning and adjust if needed. Vinaigrette can be saved under refrigeration for 4-5 days. Yields 1 cup.